Dani's breast augmentation, extended tummy tuck, and arm lift with Dr. Angkana in Bangkok! Dani lost 35 kgs from doing exercise and eating healthy and decided that she needed the skin removal after her massive weight loss. Dani shared with us her plastic surgery journey of breast augmentation, extended tummy tuck, and arm lift with Dr. Angkana in Bangkok. 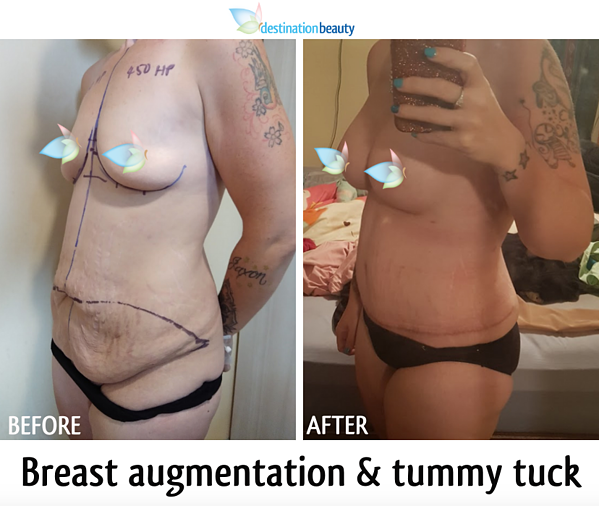 Dani's 6 weeks post op - breast augmentation, extended tummy tuck, and arm lift! We had a chance to catch up with Dani about her plastic surgery in Thailand, Dani lost a lot of weight and like most people she ended up with loose and excess skin. Coming to have excess skin removed in Thailand is a way to finish her journey and transformation. Dani and Sherry (service rep) bonded together at the hospital. Dani and nurse Aom - nurse visit at her hotel room, 7 days post op. Read more stories about skin removal surgery in Thailand – Read about Ashley's skin removal surgery in Thailand.